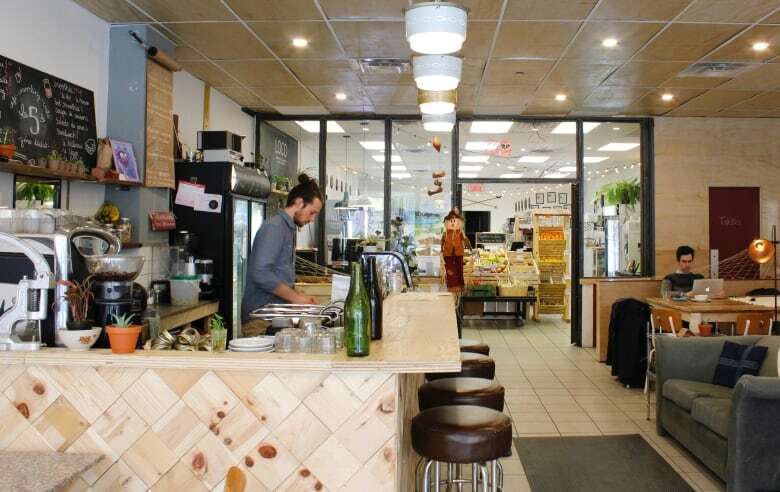 Verdun's Café le 5e aims to create no garbage, even at the take-out counter. Zero-waste blogger Julie Gagné can cram three months' worth of trash into a litre jar. 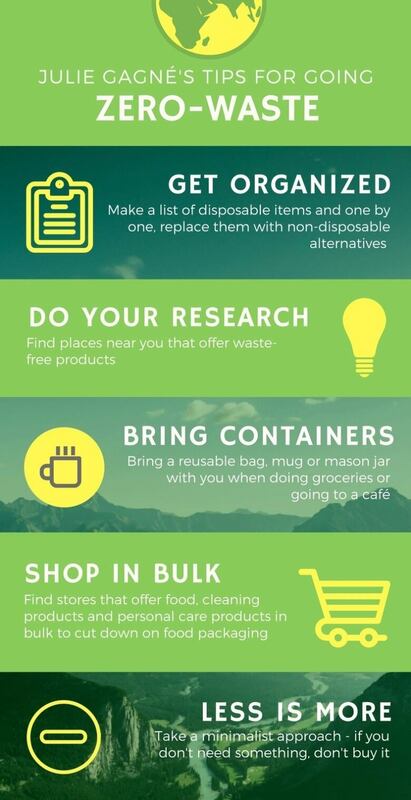 It comes down to changing wasteful habits and making sustainable choices every day. Feeding Montreal is a series that explores the political, economic, social and personal relationships Montrealers have with their food. It's a collaboration between Concordia University's journalism department and CBC Montreal. This story is the work of a team of student journalists. Vincent Dessureault reaches into a small wastebasket and removes a crumpled, brown paper bag. "This is actually compostable, so I don't know what it's doing in there," says Dessureault, Café le 5e's co-owner. It's garbage day, and in two weeks Café le 5e has barely managed to fill the small dollar-store bin. Aside from some fruit stickers, dust, broken glass and waxed paper, the bin is nearly empty. "I wouldn't be surprised, if we compared with other businesses around, what they produce in one week is what we produce in one year," says Dessureault. On the surface, the café looks like any other. But behind the scenes, the team at Café le 5e has created its very own zero-waste business model. 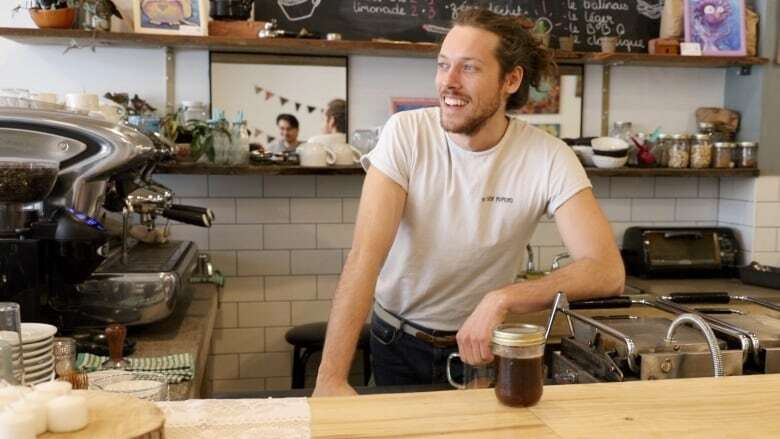 Adopting sustainable practices — eliminating unnecessary packaging, keeping product margins low so leftover food doesn't spoil, and only using reusable glasses, plates and towels — means the café creates as little waste as possible. They expect the same from their suppliers. "It's about making sure our roaster, our caterer — any of our suppliers — are actually making sure they don't produce waste in the process," says Dessureault. Currently, all of the café's orders are delivered in reusable containers or crates. Items that are not reusable, such as non-dairy milk cartons, are recycled. To reduce incoming waste from their coffee roaster, Café le 5e has arranged to reuse the bags their beans come delivered in. When the café runs out of beans, they send the bags back to be refilled, sealing them with simple binder clips. Food scraps and coffee grounds are composted right now, but the café plans to partner with a local mushroom farm that will use the grounds to enrich their soil. Dessureault says this will mean le 5e will only fill its compost bin once or twice a month. Dessureault says one of the hardest decisions for the café was choosing not to offer paper to-go cups. "We knew it would be a challenge," he says, "but we decided to go through with it." 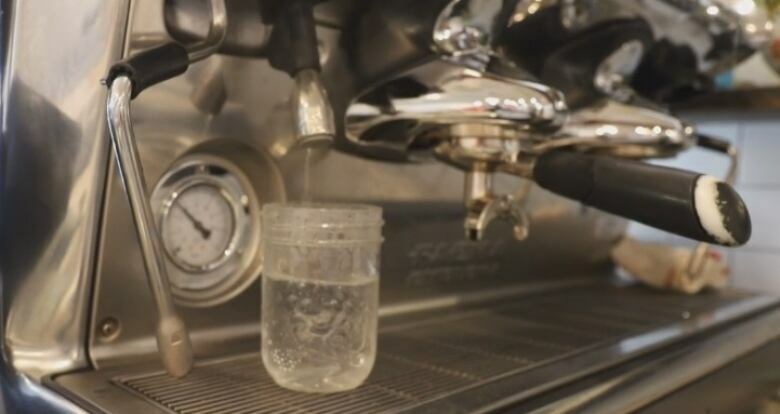 Instead, customers can purchase a reusable mason jar for a dollar. While some would-be clients find that inconvenient and walk out without a coffee, Dessureault says many more embrace the eco-conscious alternative. Habits are the hardest thing to change on a zero-waste journey, he says. "We know it is still a new concept for people, so we really want to integrate them as fluidly as possible," says Dessureault. It can be hard to change habits at home, too. At her house adjacent to the Town of Mount Royal, zero-waste blogger Julie Gagné holds up a one-litre glass jar filled with plastic wrappers. This is the only garbage she has produced in the last two months. On average, Gagné says, she can fit three months' trash into her jar. Her personal best is one jarful of garbage in six months. Like Café le 5e, leading a zero-waste lifestyle doesn't mean Gagné has, literally, zero waste. In fact, inside Gagné's jar, among a few tofu wrappers and assorted bits of plastic, there's a small chocolate bar wrapper. "When you need chocolate, and you can't concentrate, you go buy [it] in a package," she says. "That's not the end of the world!" 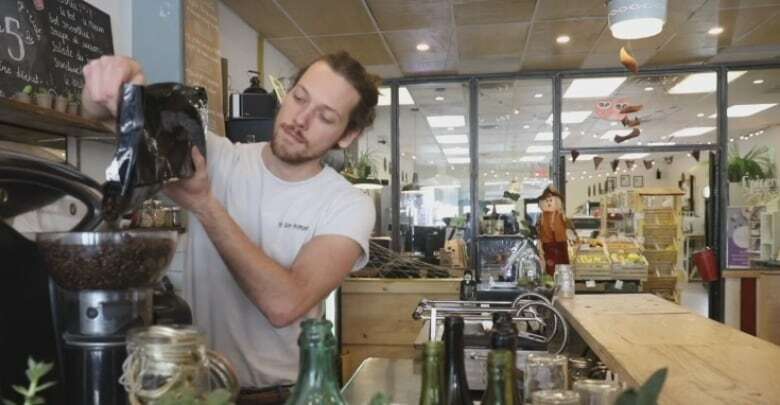 Back in 2014, Gagné was one of a small group of Montrealers practising zero waste. "Pretty much nobody understood what I was trying to do. Everyone was asking, 'Why are you trying to make less trash?' Because there's no place in landfills anymore," she says. Gagné credits her success with incorporating sustainable habits into her life: only shopping when she needs to, buying in bulk, and reusing or recycling items whenever possible. She says staying organized is one of the most important habits she has adopted. "I really plan what I need and that helps to not buy things that I don't need," she says. The zero-waste movement seems to be gaining in popularity. Last fall, more than 6,500 people attended a zero-waste festival at Marché Bonsecours in Old Montreal, where individuals and vendors gathered for two days of workshops and presentations. Karel Ménard, the director of the Front québécois pour une gestion écologique des déchets, an environmental group that promotes responsible waste disposal, says this alone shows the movement has traction. "For more than 5,000 people to show up to an event like that means that it's a movement that is really getting popular," he says. Gagné is also optimistic about the future of the zero-waste concept in the city. "I'm already seeing the movement evolve pretty quickly," she says. "There's a lot of new entrepreneurs and stores opening up every week. It's good news for people who are getting started because it'll be easier for them." Helping the public adopt sustainable practices is important to keep the movement growing, says Gagné — and to create a future with less garbage. "It's going to help the movement grow faster and faster and stronger," she says. "They will not have to struggle like I did four years ago." Feeding Montreal is a collaboration between Concordia University's journalism department and CBC Montreal. Working in small teams, students in the department's graduate diploma program found and produced original stories about the political, economic, social and personal relationships Montrealers have with their food. The students spent the winter semester developing their stories in text, audio, video, photography, infographics and maps.